The Place I love yakiniku but when it comes to options in Singapore, there aren’t many noteworthy ones around. Meet The Gyu Bar, a three months old upscale Japanese yakiniku restaurant located in the Novotel and Mercure Hotels at Stevens Road enclave. The team behind The Gyu Bar includes the founder of The Travelling C.O.W. (Chef On Wheels) and Chef Tomoo Kimura of the eponymous Japanese sushi restaurant at Palais Renaissance. The restaurant space is not particular huge with a seating capacity of 35, but what is noteworthy is the ventilation system. There is not much issue of smelling smoky after a meal here as the smoke from cooking the meats goes through each table to an underground filter system. I like this idea. The Food Before I even get to start the meal proper, it is nice to be treated to the first cup of sake here where every diner gets to choose their own sake cup from the “Sake Glass Wall”. This is the restaurant’s way of making each diner feel at home, hence the complimentary first sake of the day. I started with the Uni Waygu Yukke Cone (S$38 for 4 pieces), topped with luscious uni and beef tartare beneath. I love both ingredients, so needless to say this is a very indulgent dish for me. The other starter I had is the Signature Beef Salad (S$26), filled with slow roast roast beef and topped with onsen egg. The gravy here over the salad here is prepared from chef’s secret recipe, which is delicious. Before having the beef, I had the Tontoro (S$22), or pork neck, which has a crunchy texture. There are also three sauces available to go with the meats – Tare sauce, Leek sauce and Spicy miso sauce, where both the leek and spicy miso sauces are made in house. Without a doubt, the beef is the main highlight at The Gyu Bar for me. The main selling point is the use of Kumamoto Kuroge breed in Kyushu, Japan, where the cattles are raised in a stress-free environment. The restaurant purchases the whole cow, where the meats are chilled instead of being frozen. 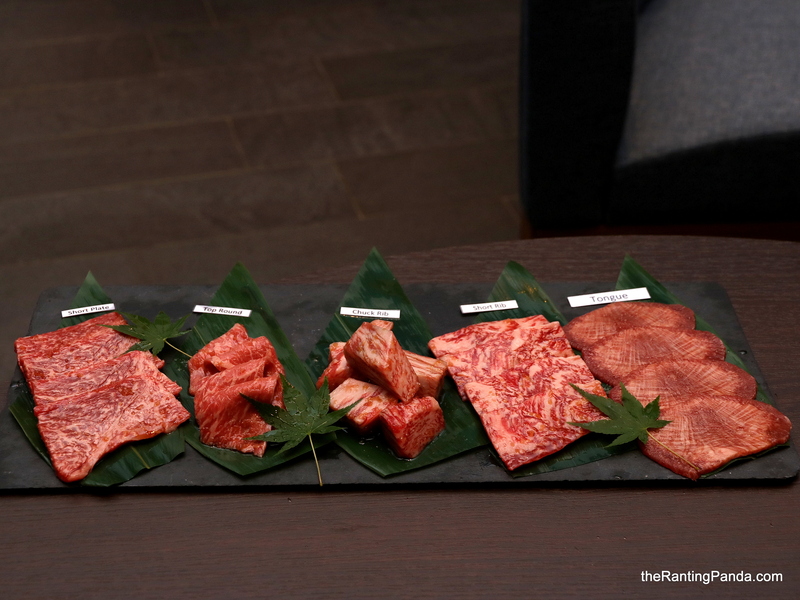 One of the highlights for me is the Omakase Beef Platter (S$178/300g ), where I get to savour five different cuts of the beef – Short Plate, Top Round, Chunk Rib, Short Rib and Tongue. I love the Short Rib and Chunk Rib as both cuts are the most succulent for me. The beef is very well-marbled with a good proportion of fat content, yet the flavours are not overly fatty. Alternatively, I also recommend the Sukiyaki Beef with Egg (S$30/serving). I had the sirloin beef, which is served together with the egg topped with black truffle. The way to enjoy this is to mix the beef and have it with the egg. It also comes with a small portion of Niigata rice which can be mixed into the egg as well, oishi! For something non meat, I recommend the Ishiyaki Garlic Egg Rice (S$15) served in a hot stone. The fried rice is very aromatic and every grain has such a nice and distinct flavour. Desserts are not the focus here, though I would still gladly end off the meal with some Japanese ice cream flavours like Yuzu and Matcha. There is also a Salt flavour, which tastes like a mix of milk and yogurt. Each flavour is available at S$6 per serving. Rants As compared to other Japanese yakiniku restaurants like Aburiya, prices here are relatively steep, as much as I would like to be back more often. Will I Return Again? The quality of the beef stands out for me at The Gyu Bar. The setting of the restaurant and the advance ventilation system also brings yakiniku to a new fine level. Just be prepared to splurge quite a bit on your visit here.